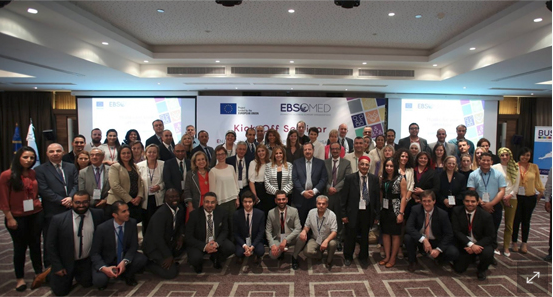 EBSOMED (Enhancing Business Support Organisations and Business Networks in the Southern Neighbourhood) is project co-financed by the European Union and coordinated by BUSINESSMED (Union of Mediterranean Confederations of Enterprises) as part of a consortium of six partners. More than thirty organisations from 26 countries are also affiliated to the project. The ultimate goal of this 4-year project (2018-2022) is to promote the Mediterranean Business Ecosystem by boosting investment and job creation in the region with a view to economic growth. This will be done through the strengthening of the capacity building of Business Support Organisations (BSOs) in the Southern Neighbourhood Countries. More specifically, EBSOMED intends to increase the overall capacity management of Business Support Organisations (BSOs) in the Euro-Mediterranean region by improving the services offered to SMEs. At the entrepreneurial level, EBSOMED will stimulate trade and investment flows by supporting the internationalization of Euro-Mediterranean SMEs. EBSOMED will give a new dimension to regional integration through the establishment of a sustainable hub and the development of win-win business partnerships in the Euro-Mediterranean region. Beneficiaries: 10 ENI South Partner Countries. Strengthen the capacities of intermediary organisations in the view of providing improved business services and tools towards their members, as well as towards trade and investment partners. Maximise business linkages through the establishment of regional coordination platforms to further substantiate new partnerships between Northern and Southern Mediterranean BSOs. Define regional strategies and action plans with the European Commission for selected sectors with a high potential for growth and employment creation. Enhance the institutional partnership between the European Union and the Southern Mediterranean Neighbourhood Countries and reinforce South-South Cooperation Mechanisms. Promote a stronger role in advocating the needs of BSOs' members in public-private dialogue and the dissemination of good practiceswith a view of enhancing the international image of Southern Neighbourhood Countries. Increase trade exchange and stimulate investment in the Mediterranean region. Ensure the viability of EU funding initiatives through a close coordination and better synergies with bilateral and regional cooperation programs.